The regulator mounts high to keep it away from the oil cooler. This kit can be used on 2009 & 2010 FLH/FLT with an updated compensator that does not require a spring cup on the rotor. The CE-94T-14 is designed to fit 2014-2016 standard air cooled FLH-FLT. The regulator mounts high to keep it away from the hot oil cooler. 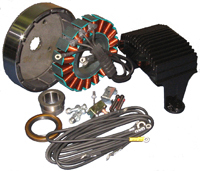 The 90 series kits produce 58 amps @ 2500 RPM and 36 amps @ 1000 RPM. They are available to cover 2011 to 2016 FLH/FLT (2009 & 2010 FLH/FLT with an updated compensator) . 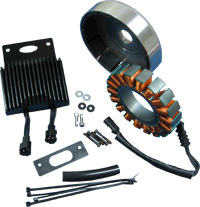 These kits produce more power to run extra accessories such as lights and stereos. 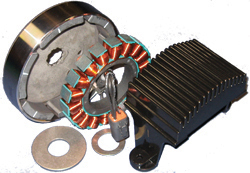 The stator in the 70 series is a slimmed down version of the larger 80 series. This allows maximum power on models where the full size stator will not fit. Thay deliver 25 amps @ 1000 RPM and 50 amps @2500 RPM. They are ideal for running extra lights and heated clothing. The CE-84T-99 will upgrade all 1999-2003 FLH-FLT to 50 amp three phase. The CE-84T-04 will upgrade all 2004-2005 FLH-FLT to 50 amp three phase. The CE-84T-09 is designed to fit 2009-2010 FLH-FLT models without oil cooler. The low mount regulator give a clean custom look. Use with stock compensator. The CE-84T-12 fits all 2011-2013 FLH-FLT models (Exept Tryglyde). The regulator mounts high to keep it away from the hot oil cooler. The CE-84T-12TG 2009-2013 Tryglyed models. The regulator mounts high to keep it away from the hot oil cooler. The CE-84T-14 2014-2016 Air Cooled FLH-FLT models. The regulator mounts high to keep it away from the hot oil cooler. The CE-84T-15 2014-2016 Wet head (Twin cooled)FLH-FLT models. The regulator mounts high to keep it away from the hot oil cooler. The CE-85T is a replacement for the stock system on 2008-2011 Dyna models. The CE-86T is a replacement for the stock system on 2008-2011 Softail models. The CE-87T is a replacement for the stock system on 2012-2017 Dyna models. The CE-88T is a replacement for the stock system on 2012-2017 Softail models. These three phase charging kits are an excellent choice to upgrade your old charging system. You get increased output over the entire RPM range and a smother charge to the battery. That means more power for accessories like lights, electronics and heated clothing. The increased low speed output is a must for fuel-injected models. Cycle electric Inc. offers 38 amp 45 amp and 50 amp three phase systems. Thay are avalable in different kits to fit specific models and years. The 38 amp and 45 amp kits are available to fit 1970-up. The 50 amp kits are available to fit 1989-up FLH-FLT. See the application chart to find the right kit for your bike. 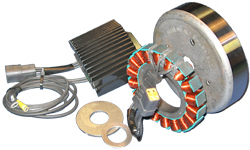 Alternators make alternating current or AC power. This means the polarity (positive and negative) is continuously switching back and forth. Batteries use direct current or DC power. This means the polarity always stays the same. AC power must be rectified which changes it to DC before it can be used to charge a battery. When single phase AC power is rectified it results in a pulsing DC power. To generate three phase AC power we use three sets of charging coils. Each coil is offset 120 degrees. When three phases AC is rectified it produces a smoother DC current output. This results in a smother charge to the battery. By eliminating the dead spots between pulses you get a considerable increase in low speed output. Cycle Electric Inc. has discontinued the 38,45 and 48 amp single-phase kits. All parts for these systems will still be sold separately. We feel our 80 series 50-amp three phase kits provide a much better value. They give better output and durability and cost less. The CE-60A is designed to fit 1970-1984 models with 4 speed ridged mount motors. The CE-62A will fit 1991-98 Dyna & 1984-99 Softail models. Use to upgrade to three phase. The CE-63T is a direct replacement for the stock system on 2001-06 Softail. The CE-64T is a direct replacement for the stock system on 2004-05 Dyna models. The CE-67T will fit 1999-2003 FXD Dyna models. Use to upgrade to three phase. The CE-68T will fit 2000 Softail. Use to upgrade to three phase. The CE-69S will fit 1991-2003 Sportster. Use to upgrade to three phase 38 amp. 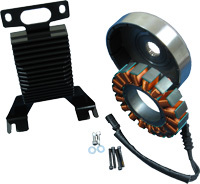 The CE-69S-04 will fit 2004-2009 1200 Sportster. Use to upgrade to three phase 38 amp. Cycle Electric Inc three 60 series three phase charging systems produce increased low speed out put and an ultra smooth charge to ensure maximum battery life. They deliver up to 20 amps @ 1000 R.P.M.and 38 amps at 2500 R.P.M. The CE-71A will fit 1979-88 FLT / 1985-88 FLH. The CE-71A is designed to fit 1988 & earlier models with 5-speed rubber mount Shovelheads and Evos (except Dyna). It will fit up to 1998 but we recommend the CE-81A kit on 1989 and later models. Note 1: 06-11 Dyna, 07-11 Softail & 07-10 FLH-FLT Models came stock with the compensator spring cup built in to the alternator rotor. If the compensator has been upgraded on these models they will use a rotor without the spring cup. Add “UC” on the end of the kit part number if you need the rotor without a spring cup. Note 3: Will not fit with low mount oil cooler. The CE-19S is for late 1984 to 1990 Evo four speed sportsters. 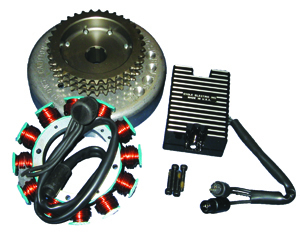 The rotor in this kit comes complete with built in clutch hub and bearing. The CE-20S fits 1992-1993 five speed sportsters. It can be used on 1991 models but the plug on the end of the DC wire will need to be changed to a ring terminal to connect directly to the circuit breaker. (Ring terminal included) The rotor has a 36 tooth sprocket. The CE-21S fits all 1994-2003 Sportsters. The rotor has a 36 tooth sprocket. The CE#-23S fits 2007-2008 883 Sportsters the rotor has a 34 tooth sprocket. The CE#-24S fits 2007-2008 XL1200 Sportsters the rotor has a 38 tooth sprocket. The CE-32A is for 1989-98 big twins with Evo style motors but will fit 1984-88 when installed with the CE-8120 shim kit.They may fit 1970-83 with the CE-8120 shim kit if clearance is available between the rotor and inner primary case. The CE-32AL is for use on Softails and custom models with horseshoe oil tanks. It is the same as the CE-32A but the regulator is specially tuned for the hotter running battery. The CE-32T is for twin cam models and will fit all twin cam motors. Recommended for bikes that normally use up to 24 amps. See applications chart. 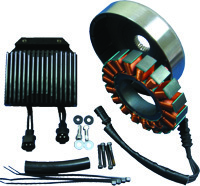 The CE-22A is a 22 amp kit that will fit any Shovel Head or Evo. Ideal for the lightly accessorised bike that normally uses 15 amps or less. 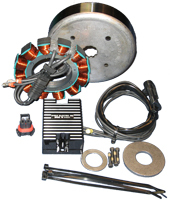 Kit # Fits On Stock Replacement Stator Rotor REG. AMPS 1000 R.P.M. AMPS 2500 R.P.M. Note 1:06-11 Dyna, 07-11 Softail & 07-10 FLH-FLT Models came stock with the compensator spring cup built in to the alternator rotor. If the compensator has been upgraded on these models they will use a rotor without the spring cup. Add “UC” on the end of the kit part number if you need the rotor without a spring cup.